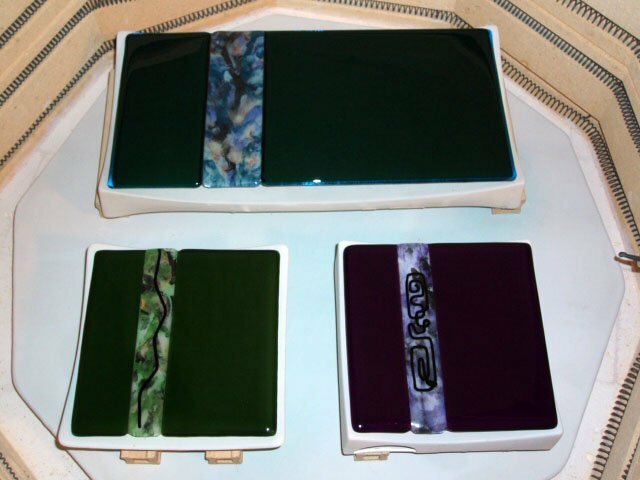 Fused Glass is sometimes referred to as ‘Warm Glass’ because it is heated in a controlled kiln environment to temperatures between 1200 and 1500 degrees, depending upon the desired results. In comparison, Stained Glass is considered ‘cold glass’, and any glass created with an open flame is considered ‘hot glass’. Examples of hot glass include Lampwork, and also Blown Glass which must reach temperatures over 2000 degrees F to achieve a liquid working state. 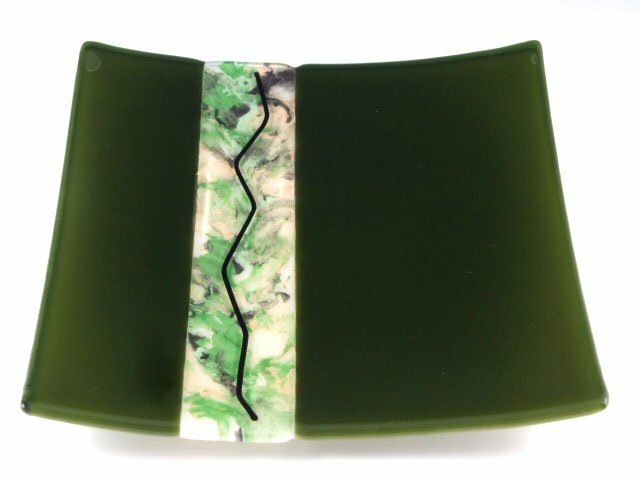 Find fused glass in Home Decor – Nestables, and Jewelry – Wearables. To join two or more pieces of glass by heating until they flow together. This requires a kiln to hold temperatures between 1450 and 1550 degrees F. All kiln processes are loosely referred to as ‘kiln firings’. Shaping glass by bending it into or over a mold. Temperatures range is between 1200 and 1300 degrees F.
Fusing small pieces of crushed glass or ‘frit’ inside a mold. Temp range is between 1500 – 1600 degrees F.
To free glass from internal stresses by gradually cooling, to toughen or temper. 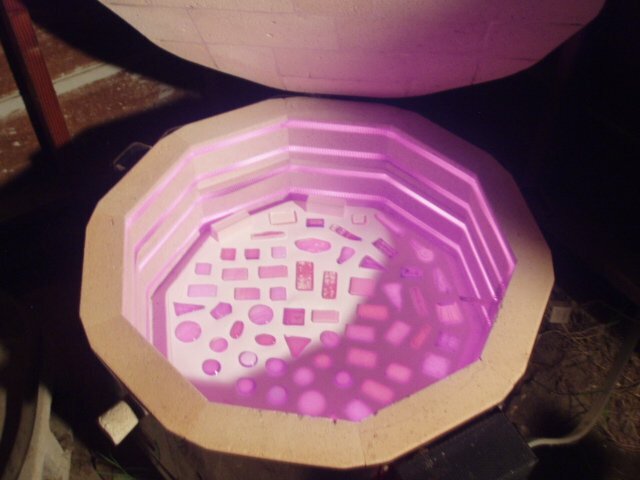 One kiln firing can take anywhere from 8 – 14 hours, depending upon the weather and desired results. 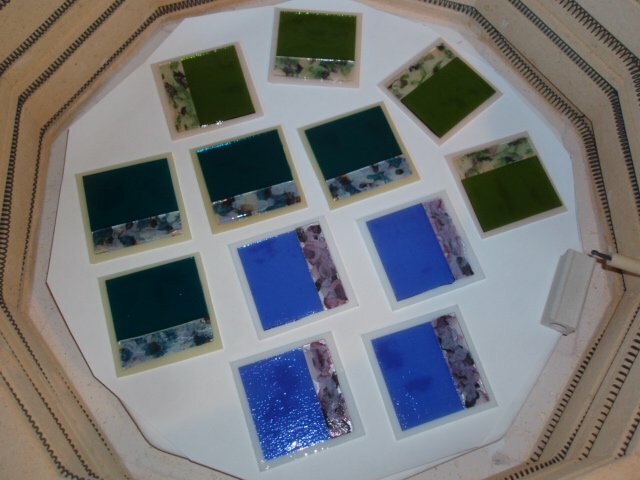 For my fused glass pieces, the glass has been through the kiln an average of 3 times, which is equivalent to 3 days. Beginning with glass, I choose from a variety of glass colors, textures, and finishes. Glass is inspiration for design to follow. Should I slump it, paint it, drill, engrave, carve, sandblast, saw-cut, enamel? I also consider the color changes when layering various transparent or opaque glasses together, the possibilities are endless! 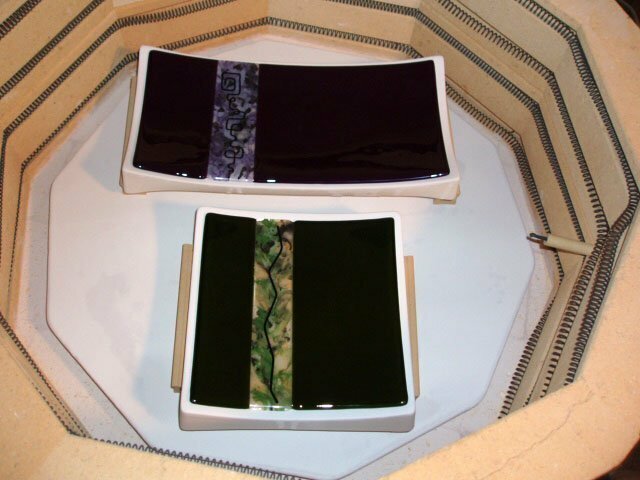 Before I begin any piece, I run kiln tests to examine glass compatibility, watch for color and texture changes, and look for anything unusual. You may have guessed, designing can take hours or even years in some cases. 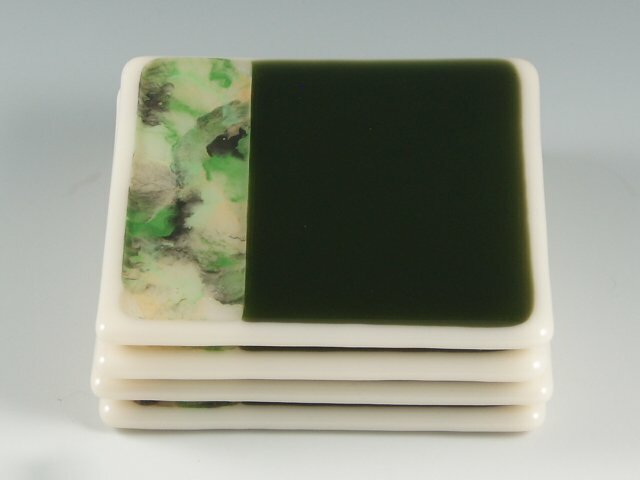 Coasters are loaded into the kiln. Finished Coasters. Yes! 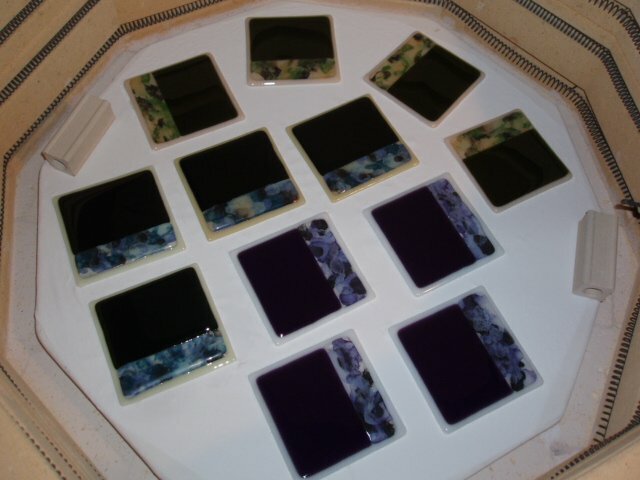 The blue glass turned dark purple! Matching trays are ready for slumping into the molds. Every Thistle Glass piece is properly fused and annealed to ensure strength and durability. Most pieces are signed if it does not interfere with the design.